The fact that this song was once relatively popular is proved by its position in Volume 2 of the Peters Edition. It is true however that today a song like Das Echo would be very unlikely to find its way on to a soprano's programme. This is partly because of its length, as the song does not make sense without at least six of its seven strophes. It is ironic that the very popularity which the composer courted with his humorous songs has come to him in fuller measure by far for his most profound ones – the very Lieder which were damned by contemporary critics as too difficult for the public. 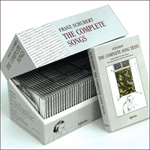 Indeed Schubert's consciously simplified songs are something of an embarrasment for the modern recitalist; it is obvious that they are something slightly less than the 'real' Schubert, and that he is attempting to hold back the best of his expressive abilities in order to pander to the philistinism of the time. Of all the many gifts given to him, the least was his ability to handle comedy. Who can think of an uproariously funny Schubert song, apart from the Klage um Ali Bey perhaps? It is perhaps only in this area that Hugo Wolf is his superior. This having been said, only Schubert could have written Das Echo. 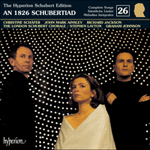 It may be made of lighter stuff than most of the Lieder, but there are many authentic Schubertian touches. The introduction is charming and graceful, the idea of the echo introduced by the fourth bar which repeats the third, in a quieter dynamic; there is a similar repetition of the final cadence at the end of the introduction. The voice part displays, hardly surprisingly, a talent for melody. Who but Schubert would have so artfully flattened the vocal line at 'grolle' to paint the anger of the mother, a singular feature which remains throughout all the other strophes? The spacing of the accompaniment, with its graceful ornamentation, is also in the composer's best eighteenth-century manner, the whole capturing the mood of a pastoral song or bergerette, a style beloved of Haydn who wrote any number of songs in this slightly saucy manner. If Schubert had been given free rein to write a modified strophic song (in the manner of Totengräberweise for example) he might have written a richer composition altogether. His brief from the publisher was almost certainly to write a simple song for the popular market, and in this we feel his wings clipped. It must also be said that Castelli's poem in the French style is from another age where the text derives from a formula (however clever the echo effect) rather than real romantic feeling. It is by no means certain when this song was written because the autograph is lost. The publisher was Thaddäus Weigl who published it in 1830 as the first of six humorous songs – but only this one was forthcoming. It seems to me that the work is not as blatantly commercial in intent or execution as the Seidl Refrain Lieder of 1828, and as Schubert was first in touch with Weigl in 1826 it is reasonable to believe that the song comes from this time. That Weigl did not publish the song immediately may have been a mark of his disappointment with it. It has a naïve sweetness about it, and it is nowhere near as bawdy as a number of Haydn's songs, or even Schubert's own Die Unterscheidung (which also features the character Hans) and Die Männer sind méchant from 1828. It is perhaps in this way that Das Echo falls between two stools, being neither a serious Lied nor a popular song. Doch ich kann nichts dafür. Das ist an Allem Schuld. Rief schnell das Echo drauf. Ob ich ihm gut kann sein? Das wär’ ihm sehr erfreulich. Rief schnell das Echo drein. Schrie jetzt das Echo laut. Dass ich das Echo war. but it was not my fault. is to blame for everything. if you would not take it amiss. for that would please him very much. has caused me such trouble. for my hand in marriage. has played this trick on him. then you must not upset him. that I was the echo.